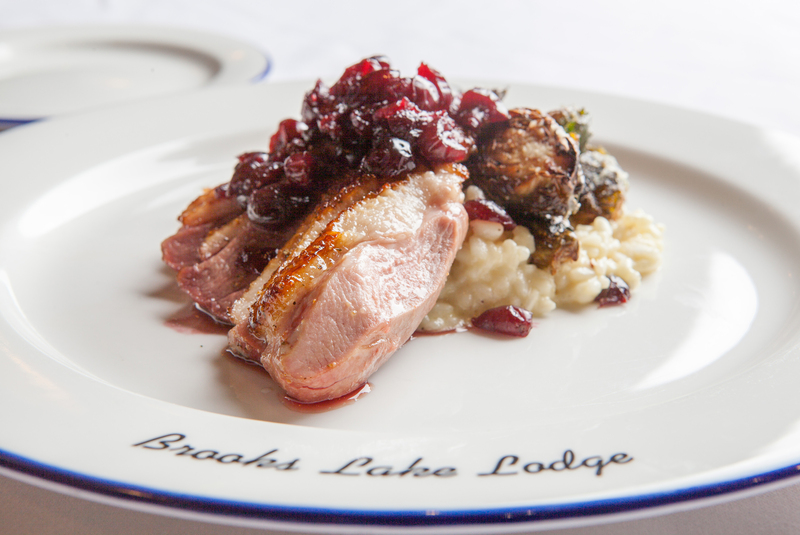 Guests of exclusive, all-inclusive Brooks Lake Lodge & Spa top off snowy winter wonderland adventures on snowmobiles, skis and snowshoes by fueling up in style with three gourmet meals served fireside daily at the Lodge’s historic Great Hall. The Lodge recently announced its new winter menu for 2018, revealing hearty and innovative locally-sourced options for foodies to enjoy. 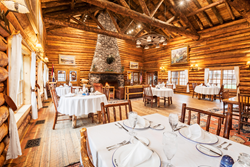 The historic Great Hall at Brooks Lake Lodge & Spa near Jackson Hole and Yellowstone, Wyoming, serves up gourmet meals fireside for guests to enjoy. Served in the rustic log-cabin-style Great Hall, dinners at Brooks Lake Lodge feature rich, indulgent flavors in a mountain-chic setting. As temperatures drop in the Rockies, Brooks Lake Lodge & Spa is turning up the heat in the kitchen and dining hall. 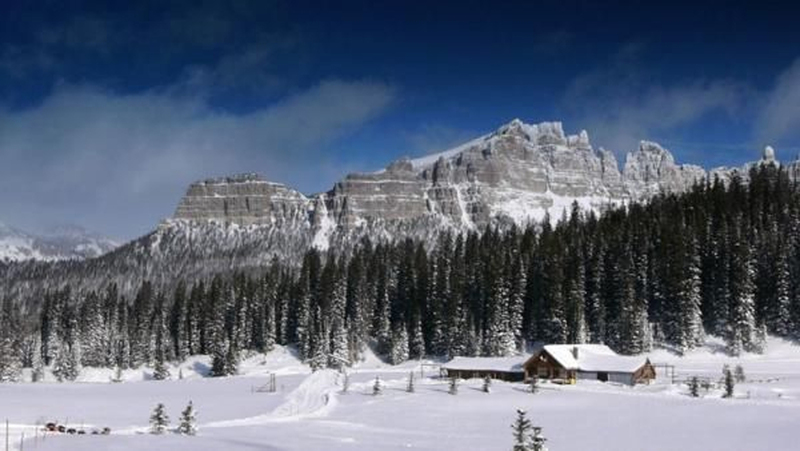 Nestled within the Shoshone Forest near Jackson Hole and Yellowstone National Park, the secluded ski-in/ski-out resort and lodge provides three gourmet, chef-driven meals per day that will please foodies and picky eaters alike. Guests can enjoy a hearty Western breakfast as pre-ski fuel, a la carte lunch options, and a rotating selection of satisfying dinner entrees made with seasonal, locally sourced ingredients all included in their overnight stay at the exclusive Wyoming guest ranch. Before guests embark on their winter mountain outdoor adventures at Brooks Lake Lodge, be it snowmobiling, skiing, ice fishing or snowshoeing, each day begins with a multitude of breakfast options—including made-to-order omelets, filling breakfast sandwiches, oatmeal and fresh fruit, decadent French toast and waffles, and unlimited coffee, tea and juices to boot. During winter, the lodge is open to the public for lunch. Those exploring the surrounding peaks can ski or snowmobile to the historic Great Hall at the lodge for a mid-day meal in a cozy setting. The a la carte menu features salads, soups and sandwiches with a Western twist. Lunchtime favorites include starting out with Ahi tuna wontons, or the lodge’s Pinnacle Poppers jalapeno and cheese dip, followed by elk sloppy Joes, Idaho-raised Kobe beef burgers, and Wild West chili loaded with savory game meats and smoky spices, as well as nutrient-dense salads such as their Duck Spinach salad with homemade balsamic bruschetta and goat cheese or the Chopped Kale salad with fried chickpeas, toasted almonds, feta and pomegranate seeds all served with scratch-made vinaigrettes. Served in the rustic log-cabin-style Great Hall, dinners at Brooks Lake Lodge feature rich, indulgent flavors in a mountain-chic setting. Adorned with Western paintings, wagon wheel chandeliers, white tablecloths and ambient lighting, the nearly century-old dining room promises a comfortable and inviting atmosphere, while in-house chefs change the gourmet menu offerings almost daily, serving up inventive takes on classic beef, poultry and seafood dishes. Recent menu items feature mouth-watering entrees and sides, including a rib-eye steak with Wyoming Whiskey au jus, roasted garlic and crispy kale linguini with a white wine butter sauce, and a roasted beet salad with blood orange vinaigrette as well as sesame encrusted seared Ahi tuna with soy ginger infused Forbidden Rice and Mandarin orange salsa. After the main course, guests can indulge in decadent house-made desserts like sweet potato pie with molasses ice cream or roasted hazelnut gelato, or curl up next to the roaring Great Hall fireplace with a cup of coffee or tea. For a late night après-dinner cocktail the lodge’s on-site Cowboy Bar offers a variety of spirits for guests. Brooks Lake Lodge & Spa, a nearly 100-year-old historic guest ranch near Jackson Hole, Grand Teton National Park and Yellowstone National Park, is located one mile from the North American Continental Divide, with views of the Pinnacle Buttes, Austin's Peak and Brooks Mountain. 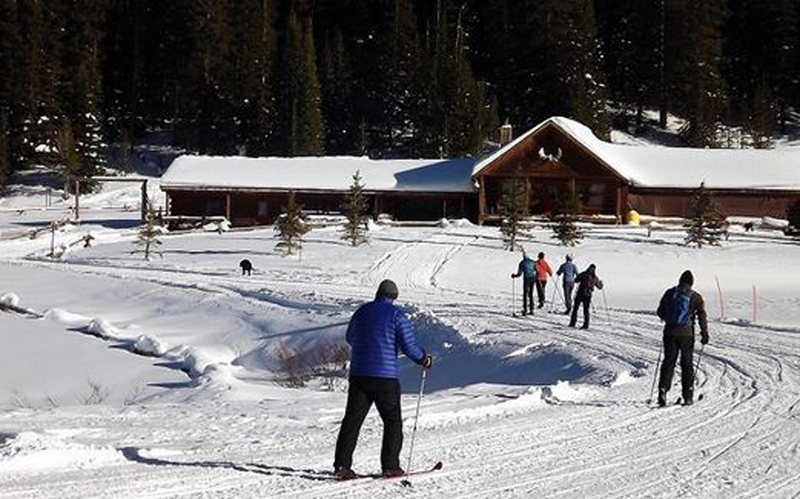 Surrounded by evergreen forests, wildlife and alpine Brooks Lake, the exclusive, all-inclusive Wyoming Rocky Mountain resort offers five-star service, luxury accommodations and gourmet dining. Named a 2017 Western Landmark and hidden gem by Western Art & Architecture, a U.S. Rocky Mountain Stunning Inn & Lodge by Vacation Idea, a Top 10 Luxury Wildlife Lodge by Money Inc. and a Travel + Leisure Great American Lodge, Brooks Lake Lodge’s rates include lodging, meals, activities and spa access. For more information visit http://www.brookslake.com or call 866.213.4022. The Brooks Lake Lodge chef prepares a daily menu of locally-sourced takes on beef, poultry and seafood dishes as a complement to the backcountry guest ranch’s roster of outdoor Wyoming adventures. In winter, daytime guests can savor a hearty fireside lunch at Brooks Lake Lodge by way of skiing, snowmobiling, snow shoeing or riding fat bikes through the snowy terrain to reach the lodge. 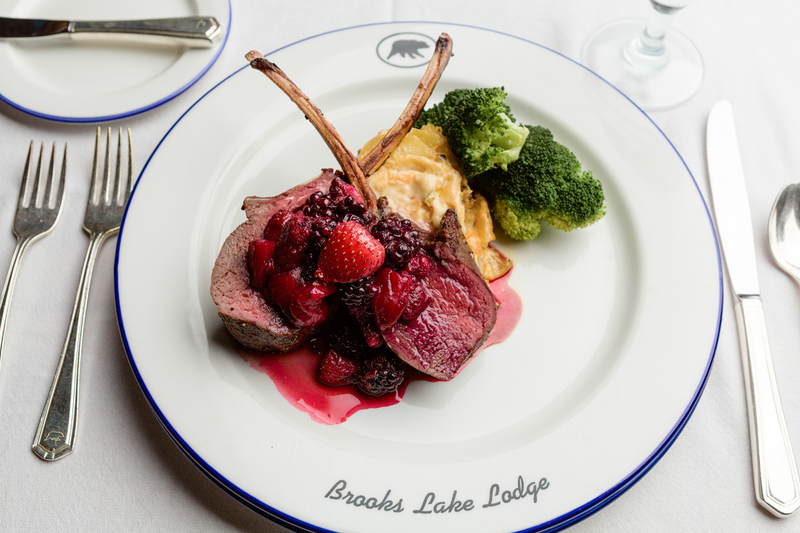 The lodge’s intimate size means the often-innovative menu changes daily at Brooks Lake Lodge to take advantage of spectacular locally-sourced meats and produce. Tucked deep in the Shoshone National Forest, Brooks Lake Lodge is an incredible vacation destination for outdoor enthusiasts and foodies looking for unique fireside feasts.